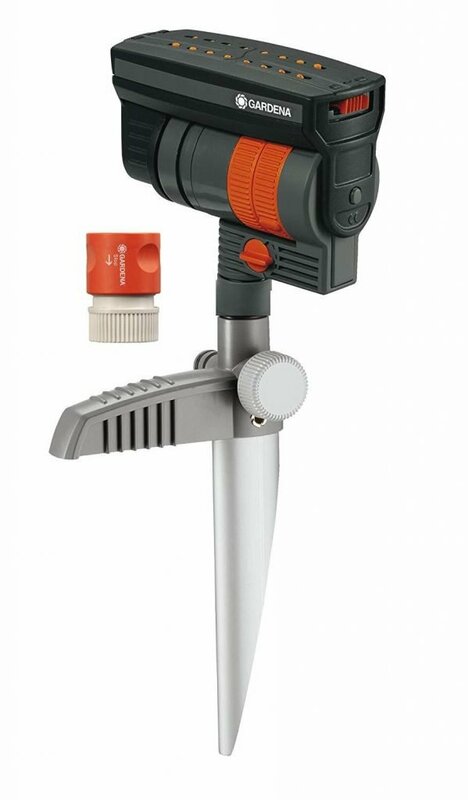 The Gardena ZoomMaxx is a compact and effective sprinkler for multifarious gardening requirements. Regardless of the size or shape of your garden, the ZoomMaxx has more flexible coverage and is more customizable than your average oscillating sprinkler. Ideal for small to medium yard spaces, the Gardena offers a generous coverage of about 1506 square feet. More importantly, it`s easy to control, consistent and robust. The Gardena ZoomMaxx is well worth your money since you can tailor its performance to address the needs of just about any lawn, including dousing it with a welcome of a heavy spray of water. But is the Gardena ZoomMaxx for you? 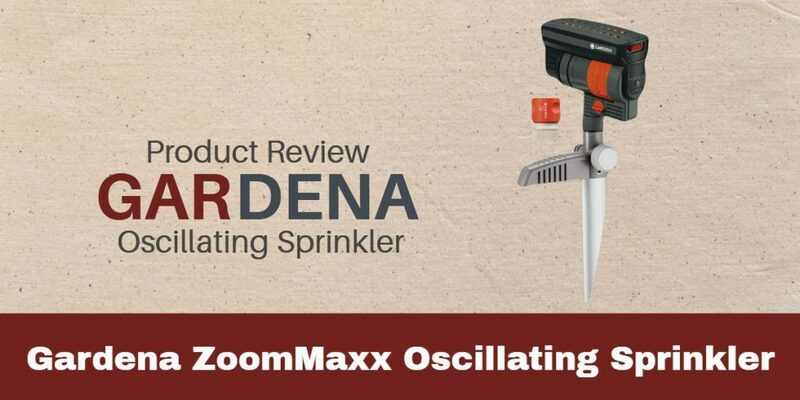 Well, read on our comprehensive Gardena ZoomMaxx Oscillating Sprinkler Review below, where we shall explore the features, performance, and shortcomings of the Gardena ZoomMaxx. Here are some top features on this Oscillating Sprinkler that makes it stand out from the rest of the oscillating sprinklers. Yes, I agree, the ZoomMaxx does not offer the best area coverage. But this should not be surprising for an oscillating sprinkler since they have a lower area coverage compared to other types of sprinklers such as the impact or stationary sprinklers. Nonetheless, with a modest coverage of 1,506 square feet and a range of up to 30 feet, the ZoomMaxx is ideal for covering the needs of small to medium yards, including your home and garden lawns, medium sizes property spaces, backyard flower garden, and greenhouse gardens. And for property owners with irregularly shaped yards, the ZoomMaxx oscillating sprinkler might be worth the extra money. A major downside with most of the oscillating sprinklers is that they are not sturdy enough. In most cases, the rotary flow of water causes them to tip slightly and change the coverage or even topple all at once. While most of them have come up with novel ideas to beat this including the clever support foot, nothing beats the metal spike design of the Gardena ZoomMaxx. The metal step spike allows you to set the ZoomMaxx firmly on the ground, similar to how you would hammer a post onto the ground, or the same way you would do with a pulsating sprinkler, also known as impact sprinkler. This is to mean the ZoomMaxx offers more control, even on the slanted topographies. To use the sprinkler, you simply need to remove it from the ground and poke it anywhere in your garden. In the absence of rain, the ZoomMaxx a pleasingly practical alternative to keep your garden hydrated every time, even at the height of summer. Featuring 16 nozzles, 8 on each side of the sprinkler head, the ZoomMaxx allows even water distribution. Additionally, it makes the sprinkler ideal regardless of the shape or size of your garden. Most importantly, is the customization that the nozzles offer. Infinitely adjustable, you can customize the length, width and spray range of the nozzle, all depending on your water-gardening needs. The strength of any sprinkler is dependent on the water flow. What we love about the ZoomMaxx is that alongside the nozzle adjustment is the water flow regulation, which allows even spray pattern and regulation of the amount of water that reaches your garden. With the Gardena ZoomMaxx, the opportunities for gardening are just but limitless for optimal performance. If you've used a sprinkler before, you know how nozzle clogging can severely affect the performance of the sprinkler. Fortunately, with the Gardena ZoomMaxx, clogging is now a thing of the past. The built-in fine-mesh filter on the nozzle protects it against blockage caused by dirt particles, dust, and sand. With the mesh in place, the sprinkler guarantees exceptional performance, reliability and a consistently high and uninterrupted flow rate. The expandability of the ZoomMaxx is in line with the flexibility of the sprinkler and goes further to underline its customization abilities. Like many of the Gardena sprinklers, the Gardena Metal Spike is ideal for use with Gardena`s Original System hoses and connectors. Ina sequence using the Threaded Tap Connector when watering the very largest of your gardens. The Gardena Sprinkler features a swivel head, and due to its vertical nature, the spray head can itself be swiveled in any direction to offer more accessibility for the oscillator and an even spread of water. That ease of use of the Gardena Oscillating goes beyond the ease of rotary movement and coverage but extends even to the operation of the sprinkler. For instance, its controls are easy to use as each nozzle on the sprinkler can also be disabled with a quick adjustment. The Gardena`s is within anyone`s alley, from functionality to price. And when comes to durability, it`s designed hard-wearing plastic that can withstand the wear and tear better of time. Therefore, don`t expect a flimsy product or anything to fall apart from the sprinkler. The Gardena ZoomMaxx also has its fair share of setbacks. First, it does not come with a cleaning kit for unclogging the nozzle, which might be upsetting for some. The largest drawback, however, is the lack of number and indicators on the adjustment dials and levels, meaning you have to memorize their position, and this can be quite frustrating, especially for the beginners, who are yet to get accustomed to the sprinkler. For the price, it`s not surprising that the ZoomMaxx has major components designed from plastic. Though it`s the hard-wearing type, it still does not match the robustness you can experience in meta-made, especially aluminum or iron sprinklers. While the above setbacks are a little upsetting, they`re not sufficient for you to do away with the product. When it comes to the price, the Gardena ZoomMaxx Oscillating Sprinkler is relatively affordable. 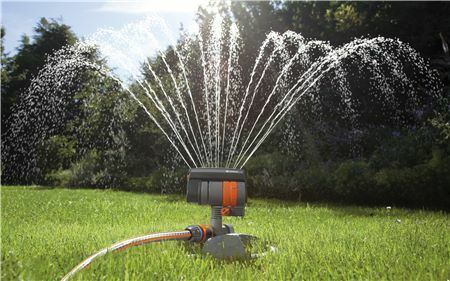 What we like most about this sprinkler is that it offers state-of-the-art performance and high-end sports features, which we only see in high-end models.